In 1837 the artist George Winter journeyed to Logansport, Indiana “. . . for the purpose . 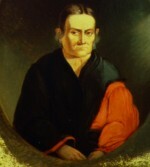 . . of seeing and learning something of the Indians and exercising the pencil in the direction.” In 1839 he visited FRANCES SLOCUM in Deaf Man’s Village (Deaf Man referred to Frances’s husband who was by this time dead) with the intention of painting her portrait for Joseph Slocum her brother. (See previous posts here , here, and here. ) Not only did he accomplish this, he kept a careful record of the experience. Preparations were . . . made for the ‘sitting.’ An old split-bottom chair was brought in by ‘Kick-ke-se-quah,’ [one of Frances’ daughters] from the adjoining room, which I placed near the little window, so as to obtain the best angle of light to fall upon her. Frances Slocum presented a very singular and picturesque appearance. Her ‘toute ensemble’ was unique. She was dressed in a red calico ‘pes-mo-kin,’ or shirt, figured with large yellow and green figures; this garment was folded within the upper part of her ‘mech-a-ko-teh,’ or petticoat, of black cloth of excellent quality, bordered with red ribbon. Her nether limbs were clothed with red fady leggings, ‘winged’ with green ribbon; her feet were bare and moccasinless. ‘Kick-ke-se-quah,’ her daughter, who seemed not to be without some pride in her mother’s appearing to the best advantage, placed a black silk shawl over her shoulders pinning it in front. I made no suggestions of any change in these arrangements, but left the toilette uninfluenced in any one particular. Frances placed her feet across upon the lower round of the chair. Her hands fell upon her lap in good position. Frances Slocum’s face bore the marks of deep-seated lines. Her forehead was singularly interlaced with right angular lines and the muscles of her cheeks were of ridgy and corded lines. There were no indications of unwonted cares upon her countenance, beyond times influences, which peculiarly mark the decline of life. Her hair, originally of a dark brown, was now frosted. Though bearing some resemblance to her family (white), yet her cheek bones seemed to have the Indian characteristics—face broad, nose bulby, mouth indicating some degree of severity, her eyes pleasant and kind. The ornamentation of her person was very limited. In her ears she wore a few small silver earbobs, peculiarly Indian style and taste. Frances Slocum was low in stature, being scarcely five feet in height. Her personal appearance suggested the idea of her being a half-breed Pottawattamie woman rather than a Miami squaw. The Miamis and Pottawattamies have very distinctive characteristics in regard to stature and conformation of head and facial appearance. The above description of the personality of Frances Slocum is in harmony with the effort of my pencil. . . . The wigwam upon the Mississinnewa, at the “Deaf Man’s Village,” was a large, double log cabin, of comfortable capacity, such as characterizes the thrifty farmer’s home in the West. A smaller cabin was attached to it, in which a very aged squaw lived. There was also a small bark hut, separated from the main log, by a distance of a few rods. In addition to these structures, were a tall corn crib and stable, all of which, unitedly, constituted the famous “Deaf Man’s Village”—the home of Mono-con-a-qua, the “Lost Sister,” Frances Slocum. Winter’s description can be found HERE. The portrait by Winter can be found HERE. In fact a meeting of the siblings took place and, with the benefit of an interpreter, information was exchanged and the identity of Frances was confirmed. Her husband, a chief named Deaf Man, had died as had two sons. She had two daughters and three grandchildren with whom she lived. One daughter was married to a man named Jean Baptiste Brouillette, of mixed Indian French ancestry, who was now the head of the household. Frances expressed her satisfaction with the arrangement. “I do no work; I sit in the house with these my two daughters, who do the work, and I sit with them.” Although she was prevailed upon to return to Pennsylvania to her white family, Frances, now Ma-con-a-quah (Young Bear), refused even to visit. I cannot, I cannot; I am an old tree. I cannot move about; I was a sapling when they took me away. It is all gone past. I am afraid I should die and never come back. I am happy here. I shall die here and lie in that graveyard, and they will raise a pole at my grave, with the white flag on it, and the Great spirit will know where to find me. I should not be happy with my white relations. I am glad enough to see them, but I cannot go. I cannot go. I have done. In 1839, Frances’ brother Joseph Slocum returned with two of his daughters (Hannah, the mother of Martha Bennett Phelps, who wrote the book Lost Sister of Wyoming, and Harriet) to visit his sister again. This passage from Hannah’s diary describes Frances and her surroundings in considerable detail. She is of small stature, not very much bent, had her hair clubbed* and tied with a worsted ferret**; her hair is somewhat gray; her eyes a bright chestnut, clear and sprightly for one of her age; her face is very much wrinkled and weather-beaten. She has a scar on her left cheek received at an Indian dance; her skin is not as dark as you would expect from her age and constant exposure; her teeth are remarkably good. Her dress was a blue calico short-gown, a white Mackinaw blanket, somewhat soiled by constant wear, a fold of blue broadcloth, lapped around her, red cloth leggings, and buckskin moccasins. The interior of the lodge seemed well supplied with all the necessaries, if not with luxuries. They had six beds, principally composed of blankets and other goods folded together; one room contained the cooking utensils, the other the table and dishes; they spread a cloth on their table and gave us a very comfortable meal of fried venison, tea, and shortcake. Her elder daughter is large and fleshy . . . she is smart, active, intelligent, and very observing. She is 34 years of age. The younger is smaller, she is quiet and retiring and is twenty-four years of age. . . . They have a looking-glass and several splint bottom chairs, a great many trinkets hand about the house, beads and chains of silver and polished steel. some of their dresses are richly embroidered with silver brooches. . . . They have many silver earrings. My aunt had seven pairs in her ears; her daughters perhaps a dozen apiece. They had saddles and bridles of the most costly kind; six men saddles and one side saddle. They have between fifty and sixty horses, one hundred hogs, seventeen head of cattle, also geese and chickens. Their house is enclosed with a common worm fence, with some outhouses, principally of logs. A never- failing spring of water is near the door with a house over it. They have a section of land (which is 640 acres) given to her two daughters. The treaty was ratified by the government this spring. *clubbed hair —a pony tail wrapped in fabric, turned under, and fastened. Biography of Frances Slocum, the Lost sister of Wyoming: A complete Narrative of her Captivity and Wanderings Among the Indians, John Franklin Meginness (Williamsport, PA: Heller Bros. Printing House, 1891). Also Frances Slocum: The Lost Sister of WyomingCompiled and written by her grand niece Martha Bennett Phelps for her Children and Grandchildren (New York: Knickerbocker Press, 1906), available online HERE. Jonathan Slocum, the father of FRANCES SLOCUM, was a Quaker from Rhode Island who had visited Wyoming Valley (see previous post) and, pleased with what he saw, brought his wife Ruth Tripp and their children there in 1777, settling on land in Wilkes-Barre a short distance from the fort. After the Massacre in July of 1778, Jonathan and his family, who had been spared, did not join the settlers who fled believing that their Quaker principles and friendly relations with the Indians would protect them. They were wrong. In November three Delaware Indians approached the house in which were Mrs. Slocum, her four young children and the two Kingsley boys the family had taken in after Indians had made a prisoner of their father. The Indians killed and scalped Nathan Kingsley; nine-year-old Mary, with great presence of mind, fled with her baby brother Joseph. The Indians, however, seized Frances, four years and seven months old, her brother Ebenezer, and the other Kingsley lad. Mrs. Slocum pleaded with them not to take Ebenezer as he was lame; they left him behind but took the other two. An alarm was given and the area searched to no avail. Several weeks later Mr. Slocum, his father-in-law, and a boy named William were gathering fodder for their cattle in a field when they were attacked by Indians. The boy escaped but the two men were killed and scalped. Mrs. Slocum bore these terrible tragedies as best she could, knowing at least that two of her loved ones, though dead, were buried. But she still agonized over the fate of Frances. Was she alive or dead? In 1906, a descendant of the Slocums, Martha B. Phelps, compiled information from various sources, including her grandfather, and wrote the story of Frances Slocum, the Lost Sister of Wyoming. According to her account this is what subsequently happened. The two sons of Mrs. Slocum, grown to manhood, searched for their sister after the Revolution in the area of Niagara, offering a reward for information about her. With no success. In 1788 the two journeyed into the Ohio wilderness on the same quest. Once again they could find no trace of her. Mrs. Slocum made the trip to Niagara in 1789 where a group of captives held by the Indians had been assembled. She could not identify any as her beloved Frances. Mrs. Slocum died in 1807 without knowing the fate of her child. The remaining family members promised her not to give up the search. There is now living near this place, an aged white woman, who a few days ago told me, while I lodged in the camp one night, that she was taken from her father’s house, on or near the Susqueha0nna River, when she was very young . . . by the Delaware Indians, who were then hostile toward the whites. She says her father’s name was Slocum; that he was a Quaker, rather small in stature and wore a large-brimmed hat; was of sandy hair and light complexion and much freckled; that he lived about half a mile from a town where there was a fort; that they lived in a wooden house two stories high, and had a spring near the house. She says three Delawares came to the house in the daytime, when all were absent but herself, and perhaps two other children; her father and brother were . . . working in the field. The Indians carried her off, and she was adopted into a family of Delawares, who raised her and treated her as their own child. They died about forty years ago, somewhere in Ohio. She was then married to a Miami, by whom she had four children; two of them are now living—they are both daughters—and she lives with them. Her husband is dead; she is old and feeble, and thinks she will not live long. These considerations induced her to give the present history of herself, which she would never do before, fearing that her kindred would come and force her away. She has lived long and happy as an Indian, and, but for her color, would not be suspected of being anything else than such. She is very respectable and wealthy, sober and honest. Her name is without reproach. . . . She had entirely lost her mother tongue, and speaks only in Indian, which I also understand. . . . I have been much affected with the disclosure, and hope the surviving friends may obtain, through your goodness, the information I desire for them. If I can be of any service to them, they may command me. . . . Biography of Frances Slocum, the Lost sister of Wyoming: A complete Narrative of her Captivity and Wanderings Among the Indians, John Franklin Meginness (Williamsport, PA: Heller Bros. Printing House, 1891). Also Frances Slocum: The Lost Sister of Wyoming, Compiled and written by her grand niece Martha Bennett Phelps for her Children and Grandchildren (New York: Knickerbocker Press, 1906), available online HERE. I was born and grew up in northeastern Pennsylvania, not far from Wilkes-Barre. My earliest impressions of the Wyoming Valley, bisected by the Susquehanna River, were physical. Of the anthracite or hard-coal fields in the area: a landscape dotted with collyeries, steam locomotives and railroad sidings, mine shafts and culm banks, refuse heaps which were often burning fueled by bits of discarded coal. Eventually this sort of mining deep underground became too expensive and was replaced by surface or strip mining which further ravaged the land until laws were passed requiring reforestation. Some of the area today still resembles the dead landscape of the moon. During the Revolution the British sought to put pressure on the American rebels by harassing frontier settlements with the assistance of the Indians who felt they had been displaced from land which was rightfully theirs. Settlers in the Wyoming Valley feeling exposed and insecure constructed several small forts for their protection. 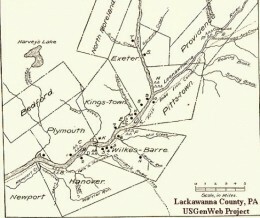 In July of 1778, British Colonel John Butler put together a force of some 1,000 consisting of British soldiers, Tories, and Seneca Indians and marched to the head of Wyoming Valley intending to clear out the settlers. Receiving news of this impending raid a small band of patriot soldiers and citizens hurriedly assembled, under the command of a Continental Army officer named Colonel Zebulon Butler, and attempted to repel the invaders. A battle ensued in which the heavily outnumbered soldiers and settlers were completely routed. Rampaging Indians slaughtered and scalped some 225 fighters and in the following days killed civilians and devastated the area, destroying dwellings and crops. Survivors fled to the east where many perished in the wilderness that was the Pocono Mountains. Living in the area I also knew of the township of Slocum but had no idea of the derivation of its name. Research led me to the story of Frances Slocum, her connection with the Wyoming Valley, and her abduction and captivity by the Indians. More of Frances’ story in the next post. How to treat the Native Americans was a perplexing question for the American colonists. Aside from problems arising from different concepts of land, its ownership and use, there was the matter of religion. Many firmly believed that attempts should be made to convert Indians to Christianity and subsidized missionary societies with that goal. After the Revolution American policy was directed not only toward converting Indians but toward “civilizing” them and encouraging them to adopt a more settled way of life. However, not everyone subscribed to the doctrine of conversion. Some questioned proselytization and suggested that Indian religious beliefs and practices be respected. Sarah Cary of Chelsea, Massachusetts, was one of these. In addition to property in Massachusetts, her husband Samuel owned a sugar plantation in Antigua of which her son Sam was in charge when she wrote this letter to him in July 1792.
. . . There was always since my remembrance a Society for Propagating the Gospel among the Indians, with how much success I am not able to tell, but I am rather inclined to believe very little. . . . As to their religion, there are various accounts about it. Some say they worship the sun, and at break of day every person upward of twelve years old goes to the waterside until sunrise, then offers tobacco to this planet, and does the same again at sunset; that they acknowledge one Supreme God above them, but do not adore him, believing him to be too far exalted above them, and too happy in himself to be concerned about the trifling affairs of poor mortals. My dear Sam, is not the particular mode of their worship as acceptable to their Maker as ours? Why are we arrogantly to presume to dictate to any sect of people if they have not the advantages of Christianity revealed to them? Neither will the fruits of that holy religion be expected to influence their conduct. For wise purposes, no doubt, have our doctrines been withheld from them. The Judge of all the earth will do right. He is the great Creator of all, and doubtless receives with equal condescension the worship of the Pagan and the Christian. Do these sentiments agree with yours? . . .
Yours most affectionately, S. Cary. Sarah Cary’s letter to her son can be found in The Columbia Documentary History of Race and Ethnicity in America compiled by Ronald H. Bayor (New York: Columbia University Press, 2013), taken from Caroline G. Curtis, The Cary Letters (Cambridge, Mass. : Riverside Press, 1891), pages 97-99. The letter can be seen online HERE. The image of Sarah Cary can be found in the Bellingham-Cary House BROCHURE.